If you’ve had the opportunity to work on an app or website with a big push on TV then you’ve probably had the fun of dealing with the resulting traffic surge. Good planning, a focus on availability and scaling in your platform, and a responsive hosting provider can help a team cope with that type of visibility. But what if instead of an app or a website, the sudden traffic growth is at a small 10th century church on an islet in Spain? 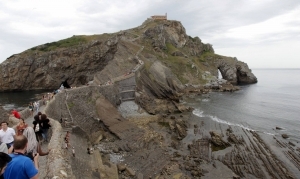 The Basque islet of San Juan de Gaztelugatxe’s chapel in Bermeo, Bizkai which serves as the filming location for Game of Throne’s Dragonstone castle has seen a dramatic and possibly overwhelming increase in tourists this past summer. According to EL PAÍS at least 75,000 tourists visited the site in July, averaging out to 2,419 people per day that scaled the long slender stairs to reach the top. Local officials are dealing with plans on how to handle the increase in visitors while supporting their tourism economy, preserving the historical significance of the site, and maintaining the unique biotope that extends from Bakio to Cape Matxitxako. This isn’t a new problem for the TV and film industry though. Other fan favorite locations such as Luke Skywalker’s island from the end of The Force Awakens or the Walsh family house that almost got sold off for a country club expansion have drawn similar attention.